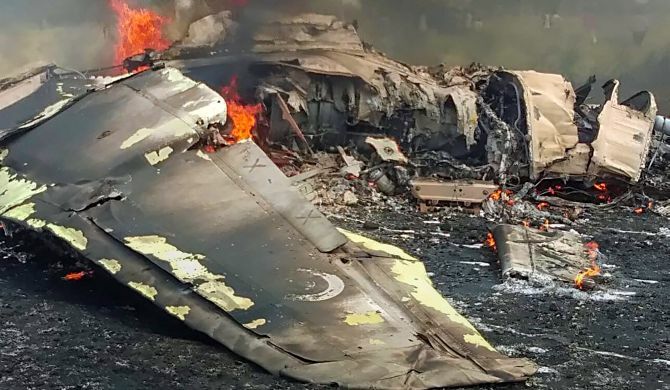 A MiG-27 fighter aircraft of the Indian Air Force crashed in an agriculture field in Jodhpur’s Banad area during a routine mission on Tuesday morning, but no loss of life was reported with the pilot ejecting safely. A Court of Inquiry will investigate the cause of the incident, defence spokesperson Colonel Sombit Ghosh said. “The MiG-27 aircraft airborne from Jodhpur crashed during a routine mission today morning. The pilot ejected safely,” he said. The Russian-made single-seater tactical strike fighter crashed within minutes of taking off from the Jodhpur airbase. The pilot was taken to a hospital in an IAF helicopter. Deputy Commissioner of Police, Jodhpur East, Amandeep Singh Kapoor said that the incident occurred in Dangyawas police station area and no loss of life or property was reported. “Police rushed to the spot and cordoned off the area. IAF investigating team has also reached the spot,” he said. Eyewitnesses said that they saw two fighter jets flying together, but one of them suddenly took a turn towards the open field and crashed near Devalia village in Banad area. “Two fighter jets were flying together, but suddenly one of them changed its course and took a turn towards the open area and crashed. We saw the pilot ejecting and he parachuted in to the agriculture field,” said Sunil Bishnoi, one of the eyewitnesses. “We believe the pilot turned the aircraft towards the field in order to avoid the crash in a populated area,” he said. Another eyewitness, Omprakash, said that he saw smoke emanating from the aircraft before it crashed.